"A thousand-mile journey starts with one step. So I think that we will start at the beginning." I recently finished walking the Overland Track, a 65 kilometre long hike through the Tasmanian Wilderness from Cradle Mountain to Lake St. Clair. Along the way, I slept in wooden huts, yet all hikers have to carry a tent in case the hut is full or in case of an emergency. This was not my first multi-day hike, but it was the first time I carried all 6 days' worth of food with me. When hiking in Israel you can always find somewhere to stock up every 2-3 days. At the beginning of the hike I was mentally comparing it with Israeli trails, but by the end I was just enjoying the atmosphere and quiet. I have to say I was surprised by the amount of Australians on the hike (the statistics reckon 80% from the mainland and another 7% from Tasmania), but enjoyed the meeting of people who are, like me, keen on bushwalking and therefore also have a certain ethos to life and how to treat the environment. One of the most amazing aspects of the hike, apart from the incredible scenery, was the disconnection from all of our modern day technology, allowing me to reconnect with G-d, nature and myself. "So prepare for a chance of a lifetime, be prepared for sensational news. A shining new era is tiptoeing nearer." The day started with my last cooked breakfast of the week to finish up my leftover eggs and cheese. Then I waited for my transfer to Cradle Mountain. The coach arrived half-an-hour after the time I was asked to wait outside, and on the way I discovered that the company combines the shuttle bus together with the tour, so we drove via the scenic route, stopping for half-an-hour at Sheffield and had an ongoing commentary about every tree on the way. Finally arriving at the visitor centre, I got my track pass, national parks pass and map. Then I took another shuttle bus to the beginning of the track at Ronny Creek and set off southwards. As I said, along the way I started comparing it with Israel. I feel that the trail (and in general Australian trails) isn't marked as well as Israeli trails, and Israel probably has one of the best markings in the world. I have to say though I was impressed by the maintenance of the trail itself, with the first day having a lot of duckboard (board planking with metal mesh on it) and the walking was easy. From Ronny Creek I walked beside Crater Lake and then climbed Marions Lookout to view Dove Lake and the area. I then continued down, having a short break at Kitchen Hut before continuing onwards. I gave both side walks to Cradle Mountain and to Barn Bluff a miss as the weather was a bit rainy and quite cloudy. Arriving at Water Valley Hut, I was greeted by the volunteer hut warden Phil and in the hut met other hikers who set out the same day. "Far over the misty mountains cold, to dungeons deep and caverns old." The second day was scheduled as quite a short walk to the next hut and I was debating if to skip a day, but upon advice from other hikers that the third day is brutal and since anyway my transfer was booked for Friday afternoon (more on that later), I decided to backtrack half-an-hour to Barn Bluff, even though it looked cloudy, hoping it would clear up. It felt very mystical and special to walk through the clouds and I felt like I was in a scene from Lord of the Rings. However, the clouds didn't clear up and after an hour in I arrived at a rock pile where the track wasn't clear on where to go. Because of the uncertainty and the cloudiness I decided to turn back. After lunch at the hut, I continued on the way. As the sun was weakly shining, the skinks were on the track in large numbers. The first one I saw was exciting, and the second was regrowing its tail and soon enough I lost count. I took the side trip to Lake Will which is known for its view of Barn Bluff. Seems Murphy had also decided to walk the track with me as the Bluff was exceptionally clear when I arrived at Lake Will. From Lake Will I returned to the main track and continued to Windemere Hut. There we saw the most chilled out wallaby, who just sat by the toilet, not caring about the passersbys. Also around the hut, I spotted some pademelons and a wombat was sighted (but not by me). "You pray for rain, you gotta deal with the mud too. That's a part of it." I was warned in advance by other hikers and rangers that the third day is the hardest, but I didn't think it would be as hard as it was. I set out with a few other hikers and we walked the day together. Most of the day we walked through forest, where the ground was mud and water puddles, covered with tree roots. To avoid getting our boots too soaked we jumped from one tree root to another, sometimes missing or slipping and getting wet and muddy. It was physically and mentally very exhausting, but we did discover a newfound sense of balance. Also, to top it, the area we were going through is known as popular with the leeches, so I made sure my lighter was easily accessible. Just before arriving at New Pelion Hut I saw a couple of kookaburrahs flying away. "A few hours mountain climbing make of a rogue and a saint two fairly equal creatures." This day is known as the mountains' day. 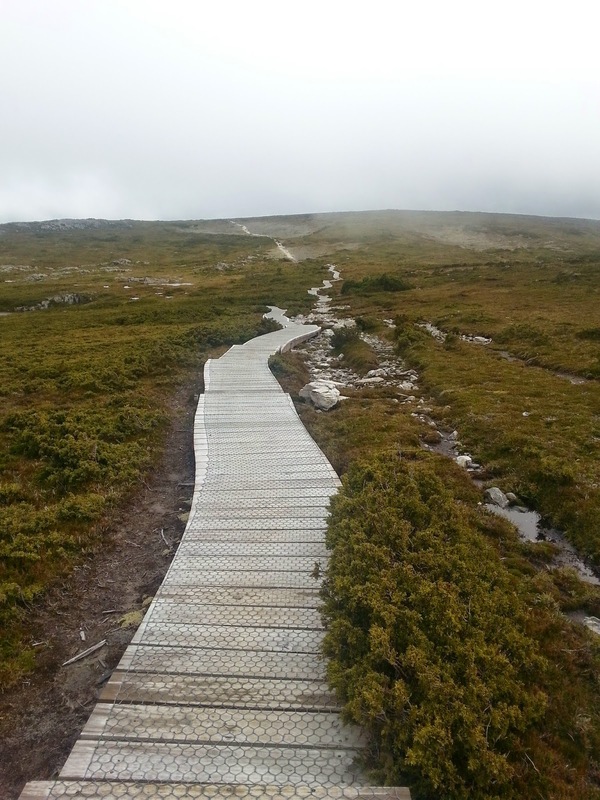 Hikers can choose to add an extra and climb Mt Oakleigh (which I was told by two hikers who did it was wet and involved river crossings which soaked their boots) or on arrival at Pelion Gap can choose to ascend Mt Ossa, the highest summit in Tasmania, and/or Mt Pelion East. Walking with the same group as the day before, we decided to take on the challenge of the highest peak on the island. It was quite a while to get to the top, involving some rock scrambling and strong winds which I felt could knock me off the mountain, but the views on the way and at the summit were amazing and the sense of accomplishment from scaling the peak is immense. After coming down from the mountain we headed to Kia Ora Hut, not without the day's fair share of mud and puddles. "Many a calm river begins as a turbulent waterfall, yet none hurtles and foams all the way to the sea." Waterfalls day was spent mostly in the rainforest, and to tie in with the day's themes we had our most rainy day on the track. During the whole day, there was an almost constant drizzle or light shower, as well as all the wet plants at the sides of the track wetting anyone passing through. My wet weather gear held up quite well and I finished the day pretty dry with the contents in my pack dry too. The three waterfalls on the side tracks were quite incredible, but as the tracks weren't the most clearly marked, I ended up doing a bit of exploring of the rainforest on my way back to the main track, and made my way to Bert Nichols Hut. "It was dark all around, there was frost in the ground." Now I return to the story of the transfer to Hobart. I had booked a transfer from Lake St. Clair to Hobart for 15:00, meaning I'd arrive at about 17:30, almost 2 hours before shabbat. A tad pressured, but doable. While on the track the group who had originally booked the transfer told me that they were booked on the 15:30 ferry, meaning the transfer would be leaving 16:00 at the earliest, but more realistically at 16:30, not giving me enough time before shabbat. Because of this I decided to head out early, try to get on an earlier ferry and hopefully hitch a ride or find a different coach. So I set out 20 minutes after the sun had risen and walked the track quickly. The ground still had frost on it and the air was crisp and fresh and I really enjoyed the walk despite having less stops than usual to savour the scenery. Most of that day the walk was through eucalyptus forest, giving an Australian feel to the hike. The early morning is one of my favourite hiking times as you can hear the bush around you wake up and I was treated to many beautifully coloured bird sightings and heard their morning songs. There are two major downsides to early hiking though: the early wake-up, which bothered me less as I had spent an average of 10 hours a night in the sleeping bag in that week, and the cobwebs in the way, which all seemed to be at eye level. I arrived at the ferry jetty 5 minutes after the 9:30 departed, but radioed the ferry operator who confirmed there would be room on the 11:30. I used my waiting time to change into the camp clothes and spread my wet gear out to dry in the sun. While waiting for the ferry another few individual hikers arrived as well as a group of 13. As we waited we enjoyed the warming sun and the amazing views of the pristine Lake St. Clair (some people even went in for a swim). To truly mark the end of the journey we got a view of the symbolic and rare Tasmanian wedge-tailed eagle circling above us and then saw a platypus in the water while riding the ferry. At the visitor centre I waited for a lift, feeling like I was back in the army. After 2.5 hours and many people who were heading in the opposite direction, two lovely Canadian girls had room in their car and were driving to Hobart, and even to the same hostel. Another 2.5 hours later we arrived at the hostel and I just had enough time to shop, catch up with the family, shower and get ready for shabbat in Hobart, which I will expand upon along with my adventures here in the next post. "פו היה אומר: ברור לכולם שמסע צריך להתחיל ברגל ימין, הבעיה היא לדעת איזה מבין השתיים היא רגל ימין. אחרי שבחרת מה היא רגיל שמאל, ברור שהשנייה היא רגל ימין..."
בזמן האחרון סיימתי ללכת את טרק האוברלנד, שביל באורך 65 קילומטר בטבע הטסמני מהר קריידל עד אגם סיינט קלייר. לאורך הדרך ישנתי בבקתות עץ, אך כל המטיילים היו צריכים לסחוב גם אוהלים למקרה שהבקתה מלאה או למקרה של מצב חירום. זה לא היה הטיול הראשון שלי עם שינה בשטח, אבל זו כן הייתה הפעם הראשונה שסחבתי אוכל ל-6 ימים איתי. כשמטיילים בארץ תמיד יש מקום לקנות עוד אוכל כל יומיים-שלוש. בתחילת המסלול השוותי אותו לשבילים הישראלים, אבל בסוף פשוט נהנתי מהאווירה ומהשקט. אני חייב להגיד שהופתעתי מכמות האוסטרלים (הסטטיסטיקה אומרת 80% מהיבשת ועוד 7% מטסמניה), אבל נהנתי מהמפגש עם אנשים, שכמוני, אוהבים לטייל ויש להם דרך חיים מסוימת ויחס לסביבה. אחד הדברים המדהימים בטרק, חוץ מהנוף המדהים, היה הניתוק מהטכנולוגיה המודרנית, שאיפשר לי להתחבר מחדש עם א-להים, הטבע ועם עצמי. "נתכונן לשינוי בחיינו... תקופה ככה זוהרת אלינו דוהרת." היום התחיל עם ארוחת הבוקר החמה האחרונה של השבוע לסיים את שאריות הביצים וגבינה. אחרי זה חיכיתי להסעה שלי להר קריידל. האוטובוס הגיע חצי שעה אחרי הזמן שאמרו לי לחכות מחוץ לאכסניה, ובדרך גיליתי שהחברה משלבת את ההסעה עם הסיור שלהם, אז נסענו בדרך הנופית עם עצירה של חצי שעה בשפילד בדרך והסבר בלתי פוסק על כל עץ בדרך. לבסוף הגענו אל מרכז המבקרים, ואספתי את הניירות המאשרות לי לטייל במסלול ואת המפה. אז לקחתי עוד הסעה אל תחילת המסלול בערוץ רוני והתחלתי ללכת דרומה. כפי שאמרתי, בתחילת הדרך השוותי את המסלול לישראל. אני מרגיש שהשביל (ובאופן כללי שבילים באוסטרליה) לא מסומנים בצורה טובה כמו שבילים בישראל, וישראל היא כנראה המדינה עם אחד מסימוני השבילים הטובים בעולם. אני חייב להגיד אבל שהתרשמתי מרמת התחזוק של המסלול עצמו, כאשר ביום הראשון היה הרבה דאקבורד (קרשים עם רשת מתכת) וההליכה הייתה קלילה. מערוץ רוני הלכתי לאורך אגם קרייטר ואז טיפסתי אל תצפית מריונס לראות את אגם דאב והסביבה. אחרי זה ירדתי למטה, עם עצירה קצרה בבקתת "קיצ'ן" (מטבח) לפני שהמשכתי הלאה. ויתרתי על המסלולים הצדדיים להר קריידל ובארן בלאף כי היה קצת גשום ודי מעונן. כשהגעתי לבקתת "ווטר ואלי" (עמק המים) קיבל את פניי פיל, מתנדב שאחראי על הבקתה ושם פגשתי מטיילים אחרים שיצאו באותו יום כמוני. "הרחק מעבר להרים הערפיליים והקרים, אל מרתפים עמוקים ומערות ישנים." היום השני תוכנן כיום קצר אל הבקתה הבאה והתלבטתי עם לדלג על יום, אבל בעצת מטיילים אחרים שהיום השלישי קשה מאוד וכפי שההסעה שלי הוזמנה לשישי בצהריים (עוד על זה בהמשך), החלטתי לחזור חצי שעה אל בארן בלאף, למרות שהיה נראה מעונן בתקווה שיתבהר. הרגיש לי מאוד קסום ומיוחד ללכת דרך העננים והרגשתי בסצנה משר הטבעות. אבל מזג האוויר לא התבהר ואחרי שעה הגעתי לערימת סלעים בו השביל לא היה ברור לאן הוא מוביל. בגלל חוסר הוודאות והעננות החלטתי לחזור אחורה. אחרי ארוחת צהריים בבקתה המשכתי בדרכי. באור החלש של השמש החומטים היו על המסלןל בכמויות. הראשון ריגש אותי, והשני היה בתהליך גידול זנב חדש אבל במהרה הפסקתי לספור. הלכתי במסלול הצדדי אל אגם וויל, הידוע בתצפית שלו אל בארן בלאף. נראה שמרפי גם בא לטיול כי בארן בלאף היה בהיר ובלי עננים כשהגעתי לאגם וויל. מאגם וויל חזרתי לשביל הראשי והמשכתי אל בקתת "ווינדמיר". שם ראינו את הוואלבי הכי רגוע בעולם, והוא פשוט ישב ליד השירותים, אדיש לעוברים ושבים. עוד בסביבות הבקתה ראיתי פדמלונים (דומים לוולאבי) וגם מטיילים אחרים ראו וומבאט. "כשאתה מתפלל לגשם, אתה צריך להתמודד גם עם הבוץ. זה חלק מזה." מטיילים אחרים ופקחים הזהירו אותי מראש שהיום השלישי הכי קשה, אבל לא תיארתי לעצמי שהוא יהיה קשה כמו שהוא היה. יצאתי עם עוד כמה מטיילים והלכנו במשך היום יחדיו. רוב היום הלכנו דרך יער, כשהאדמה הייתה מלאה בוץ ושלוליות מים, מכוסה בשורשי עצים. כדי שנעליים שלנו לא יספגו לגמרי, קיפצנו בין השורשים, ואם פיספסנו או החלקנו אז נפלנו לבוץ. זה היה מתיש פיזית ומנטאלית, אבל מצאנו תחושת שיווי משקל מחודשת. וגם, כדי להוסיף לצרותינו, האזור בו עברנו ידוע בתור מקום עם עלוקות, אז דאגתי שהמצית שלי יהיה בהישג יד. בדיוק לפני שהגענו לבקתת "ניו פליון" ראיתי זוג קוקברות עפים מעלינו. "כמה שעות של טיפוס הרים גורמים לנוכל ולקדוש להיות שני יצורים די שווים." היום הזה ידוע כיום ההרים. מטיילים יכולים לבחור להוסיף יום למסע ולטפס את הר אוקלי (שנאמר לי ע"י זוג מטיילות שהיה רטוב וכלל חציית נהרות שהרטיב לגמרי את הנעליים) או בהגעה אך מעבר פליון ניתן לבחור לעלות את הר אוסה, הפסגה הגבוהה בטסמניה, ו/או את הר פליון המזרחי. ביחד עם אותה קבוצה שהלכתי איתה ביום הקודם, החלטנו להענות לאתגר של הפסגה הגבוהה באי. לקח זמן להגיע למעלה, וכלל טיפוס על סלעים ורוחות חזקות שהרגשתי יכולות להעיף אותי מההר, אבל הנוף בדרך ובפסגה היו מדהימים והרגשת ההצלחה מהטיפוס הייתה עצומה. אחרי שירדנו מההר, הלכנו אל בקתת "קיאה אורה", אבל לא בלי המנה היומית של בוץ ושלוליות. "פעמים רבות נהר רגוע מתחיל כמפל סוער, אך אף אחד מהם אינו קוצף כל הדרך אל הים." יום המפלים היה ברובו ביער הגשם, וכדי להשתלב עם הנושא היומי גם מזג האוויר היה גשום. במשך כל היום היה באופן כמעט רציף טפטוף קל עד בינוני, בנוסף לצמחים הרטובים לצידי הדרך שהריבו את כל מי שעבר. הציוד שלי לגשם הוכיח את עצמו ובסופו של היום הייתי יבש וכך גם תוכן התיק שלי. שלושת המפלים במסלולים הצדדיים היו נהדרים, אבל כפי שהשביל אליהם לא היו מסומנים בבירור כלל, יצא לי לשוטט ולחקור את יער הגשם בדרך חזרה אל השביל הראשי, ומשם המשכתי אל בקתת "ברט ניקולס". "היה חשוך מסביב, היה כפור באדמה." עכשיו אחזור אל הסיפור של ההסעה להובארט. הזמנתי הסעה מאגם סיינט קלייר להובארט ב-15:00, כלומר שהייתי מגיע בסביבות 17:30, כמעט שעתיים לפני שבת. קצת לחוץ, אבל אפשרי. באחד הימים במסלול, הקבוצה שבמקור הזמינו את ההסעה אמרו לי שהם לוקחים את המעבורת של 15:30, כלומר שההסעה תצא הכי מוקדם ב-16:00, אבל כנראה יותר בטזור 16:30, מה שלא היה מאפשר לי מספיק זמן לפני שבת. לכן, החלטתי לצאת מוקדם, לנסות להגיע למעבורת מוקדמת יותר ובתקווה לתפוס טרמפ או הסעה אחרת. אז יצאתי 20 דקות אחרי שהשמש זרחה והלכתי את המסלול בהליכה מהירה. האדמה עדיין הייתה עם שכבת כפור עליה והאוויר היה טרי ומאוד נהניתי מההליכה, למרות שיצרתי פחות מהרגיל ליהנות מהנוף. רוב היום השביל עבר ביער אקליפטוס, ונתן הרגשה אוסטרלית לטרק. הבוקר המוקדם הוא אחד מהזמנים האהובים עליי לטייל בהם כי אפשר לשמוע את הטבע מתעורר וזכיתי לראות הרבה ציפורים צבעוניים ולשמוע את שירת הבוקר שלהם. יש שני חסרונות עיקריים לטיולים מוקדמים: ההשכמה המוקדמת, שפחות הפריעה לי אחרי ממוצע של 10 שעות בלילה בשק שינה במהלך השבוע, וקורי העכביש בדרך, שאיכשהו היו כולם בקו העיניים שלי. הגעתי למזח המעבורת 5 דקות אחרי המעבורת של 9:30, אבל מפעיל המעבורת אמר ברדיו שיהיה לי מקום במעבורת של 11:30. בזמן שחיכיתי החלפתי לבגדים נקיים יותר ונתתי לציוד הרטוב להתייבש בשמש. בזמן שחיכיתי למעבורת עוד כמה מטיילים בודדים הגיעו בנוסף לקבוצה של 13. בזמן שחיכינו נהנו מהשמש החמימה ומהמראה המדהים של המים הצחים של אגם סיינט קלייר (היו אפילו אנשים שנכנסו לשחייה). כדי לסמן באמת את סוף המסע זכינו במראה של עיט זנב הטריז הטסמני הסמלי והנדיר חג מעלינו ולאחר מכן ראינו ברווזן במים כשנסענו במעבורת. במרכז המבקרים חיכיתי לטרמפ, עם הרגשה שחזרתי אחורה בזמן לצבא. אחרי שעתיים וחצי והרבה אנשים בלי מקום ברכב או שנסעו לכיוון ההפוך, שני בחורות קנדיות חביבות אמרו שיש להן מקום והן נוסעות להובארט, ואפילו לאותה אכסניה. אחרי עוד שעתיים וחצי הגענו לאכסניה והיה לי בדיוק מספיק זמן לעשות קניות, לדבר עם המשפחה, להתקלח ולהתכונן לשבת בהובארט, עליה ארחיב ביחד עם חוויותיי פה בפוסט הבא.